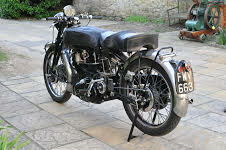 A 1937 Velocette Works 500 tool room copy, registration number 253 UXE, frame number SF9, engine number MT5011, gear box number 10-2600, Black. Although Velocette never made a 500cc production version of the iconic 350KTT they did produce two special 500cc singles for works riders Stanley Woods, Ted Mellors and Ernie Thomas. These works 500's were primarily constructed to compete at the Isle of Mann TT and hence had some unique features including the fitting of the oil tank on the left hand side to suit filling in the pits at Manx circuit. The 500cc Velo had a new frame to accommodate the tall engine, with fully pivoted fork rear suspension in the case of the Stanley Woods ride. From 1937 the engine featured the ten inch square heavy finned head and barrel which gave the engine a huge appearance. This beautifully constructed 500 Velocette is a tool room copy of one of these works motorcycles which was constructed to an exacting standard by Bob Jolly with input from Rod Coleman and final assembly by Martin Lewis due to Bobs untimely demise. 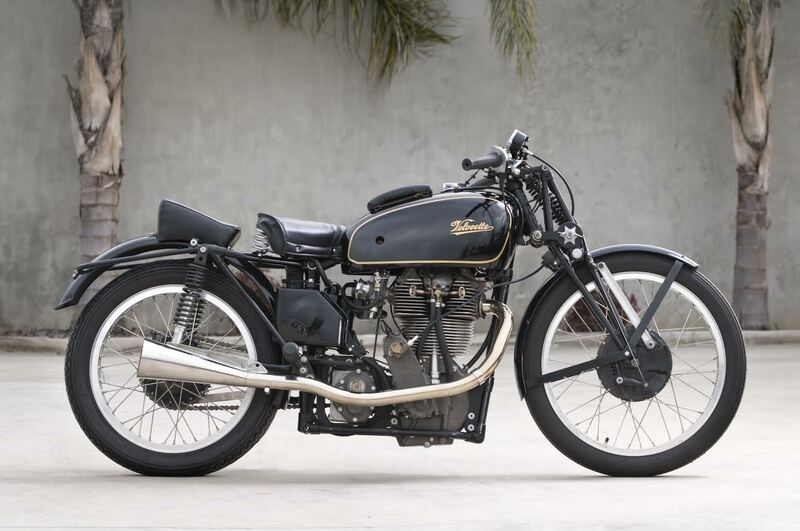 The vendor purchased the Velocette direct from Bob Jolly's estate and personally imported it into the UK in 2012. Documentation on file shows that the Velocette was MOT'd on the 19 December 2013 and was allocated the age related registration number 253 UYE on 2 January 2014. The large accompanying history file contains import documentation, MOT certificate, DVLA correspondence, V5C, photographs and general correspondence.